Why was I so excited about going to Slovenia? Except from the first days of cycling in the north of Italy, in South Tyrol and Trentino, and Venice (of course), it had been a quite monotonous and frustrating country to cycle in. The landscape was flat, which obviously makes cycling easy, but also meant all land was occupied by houses or cultivated. There was no ‘free’ land, places where nature was left to itself, and when travelling like we do, we somehow feel more home in such free places. This is where we have a right to be like everyone else does, what is nobody’s is everybody’s. In Italy everywhere was somebody’s place. This feeling was enhanced by all the fences that surrounded the land and the houses. I did not really understand, why they needed high fences and gates around their houses, property and even around all those abandoned buildings and plots. Who or what were people so afraid of? It did one good thing for us and it was to keep the barking dogs in, but that again only made me feel even less welcome. It was this I was expecting would change when going to Slovenia and the Balkans. I wasn’t sure exactly what I expected, but I knew it was something more wild, untamed and unowned. A region more welcoming to people travelling like we do. And my expectations were met and even exceeded by Slovenia. We crossed into the country on a small, winding road that went over gentle hills of wild forest and grassy fields. Only around the few, nice-looking houses and sleepy villages was the land cultivated, mostly with vineyards, vegetables and lots of colourful flowers. Most of the land seemed to be left to nature’s control though. The diversity of wild flowers, plants and colourful insect were remarkably changed from Italy and if you listened, the birds’ singing was a polyphonic soundtrack to it all. And you could hear it because the traffic was light and the roads quiet. It was bliss to cycle. There were no fences here. We were welcome and we were in the nature. And it seemed to go on and on. We soon found a football pitch (another plus to the list of pluses for Slovenia) and had another round of penalty shoot outs and once I again I was mysteriously victorious even though I have no skills as a keeper whatsoever and Chris has years of practice with kicking and dribbling and tried to trick me in an all kind of ways. But this day he finally revealed the reason why I kept winning, as he showed me how hard he could actually kick the ball towards the goal, but only when I was not standing in it. That dear man could not kick it full on right at me, but if he did he surely would win our matches by scoring every time. I felt less victorious, but very loved. Instead we began another round of The Spotting Things Game and Chris quickly took the lead while I desperately looked for a wild mammal and a blue flower amongst the diverse display of white, yellow, red, pink and purple wild flowers. Near the town of Sezanne the roads got busier, but the drivers here seemed much more considerate and patient than the Italians, holding back behind us until it was safe for them to overtake on the winding roads. As if Slovenia had not already proved its worth as a perfect destination for cycle touring we now found that there was a Lidl in the town. With cheap ice cream to cool us down and a big jar of peanut butter for sale, something we had not been able to buy since we had been in Holland. There seemed to be no end to the wonders of Slovenia. Our route led us right through a place I had fantasised about when I was a child without ever imagining that one day I would be there. It was Lipica, the place where the Lipizzaner horse had been bred in unbroken lines since 1580. Originally these horses were bred for military use, but these days they are world famous for the shows by the Spanish Riding School (confusingly in Vienna) that only use the white stallions of this particular race (I’m sure you all know what I’m talking about and if not look HERE ). As a girl I had dreamt away in pictures of these white horses doing all kind of spectacular things in a special kind of show dressage inspired from the military. I wanted to be one of those riders working with these fantastic animals, but my dream was out of reach as it was a part of the whole tradition that only men were considered as riders. And today I’m happy I’m not a rider of the Spanish Riding School, but one of my own freedom on my green steel-horse. There was an entrance fee to get into the stables, so Chris and I just placed ourselves behind the fence (yes, there was one fence in Slovenia and once again we were on the wrong side) because from there we could still see some of the horses, a group of white mares with their dark brown foals relaxing in the shade in the hot afternoon. For me it is almost meditating watching groups of horses, to see how they gradually move around driven by instincts to find food while interacting hierarchically with each other in their own body language. For Chris, I think it was more amusing to watch my excitement and joy when watching the horses. A group of Indian tourists came by the paddock with mares led by a guide and they looked secretly at us two, deliberately poor and homeless people sitting outside the fence. The irony of it was not lost on us, what a weird world we’re part of. The guide was indifferent to who had paid and who had not. He approached us asking about the bikes and our travels, and I soon asked him questions about the history and facts of the place and through the fence he proudly and passionately told me all that he had probably just told the paying Indians. We were interrupted by the sound of running horses and we both excitedly stood up to see 65 other mares being led from one paddy to another running in a flowing row of uniform and yet individual, white elegant creatures. It was an amazing sight. Chris was good to take pictures of it all so that I could just concentrate on taking in the moment with my own eyes. It was a moment more special than I had imagined it could be, it awoke my old passion for horses that had faded as I grew older and life had gotten more serious, complicated and time consuming with education, work and the social life of the teenage years. But the horses represented that pure passion for something that doesn’t have any purpose, but only can be understood from the heart. We left Lipica and began looking for a place to camp. It should be the easiest thing as there was nothing but wild nature around, but unfortunately wild nature also holds such irritating beings as tiny, little ticks that attacked Chris the first place we stopped to settle in for the night. So we went on now looking for a place without long grass which was a much harder task. Eventually we found an overgrown driveway between two roads that we could camp next to just out of sight from the traffic. It was not the natural wonder I had dreamed about, but instead it kept a secret, that of an old cooling complex, which was a huge hole in the ground that back in time before electricity and fridges had been filled with ice to be used in households and such for cooling. It was impressive, overgrown and forgotten and it was impossible to imagine the thing full of ice. Where would all that ice come from, how did people get it there and how could it keep frozen there in the warm summers? We wondered and believed. Slovenia felt like a little paradise. People seemed to live good lives in nice houses, the land felt open and free and nature in its natural state seemed to be something that was cared for and appreciated. There was clean water in public taps in the little, sleepy villages (something I had not expected to find so far from Denmark, as I usually become suspicious of tap water as soon as I get south of Hamburg) that also all had several containers for recycling, so that it was easy to get rid of your litter in a responsible way instead of leaving it in the nature. I might romanticise this country, but the one day we spent there gave me the impression of a part of the world being in a more harmonious state with humans living in balance with and respecting nature. The only thing I could complain about in this country was that it didn’t seem to have a single blue flower, and therefore Chris won The Spotting Things Game that day. We left Slovenia with it very high up on the list of places that we must return to someday. Dea was right, it had been a fantastic place to cycle, but there was also so much ahead of us to look forward to in the Balkans. This is a region with a fascinating diversity of cultures and of course a terribly troubled recent history. The break up of Yugoslavia happened within my lifetime, and yet I had shamefully little knowledge of the region and its people. The weeks just ahead of us were therefore very exciting, and not just because they were going to be very good for my country-count. Our transition from Slovenia to Croatia was an easy one, for after crossing a remote border point where our passports were checked for the first time on the trip (even though Croatia is in the EU), we continued on an excellent quiet road through the same great nature. The road wound through a landscape of rocks and trees, where nobody seemed to live except for one deer that we stopped and watched. It was frolicking, like, well, a deer. “That must be one happy deer,” remarked Dea, as we looked around at all the great nature that it had to enjoy. Our luck broke the next morning, when we awoke to heavy rain. We got our things packed up anyway, and were on our way out of the forest we’d camped in when Dea noticed she had a flat tyre. Like a trooper she got it fixed in the rain, and then it was on with our day. As chance should have it we now had a big downhill, which meant we were soon very wet, and to make things even worse we left behind our idyllic nature and had to share the road with cars. The rain was coming down harder and harder, and as soon as we could we escaped to the refuge of a cafe. Here we sat and dried off and made use of the free wifi, grateful, suddenly, to take a break from all that nature. But it never rains forever, and we were soon back on our way again, doing our best to take the small roads through the villages, which took us up into the hills and gave us views down to the Adriatic and its islands. We camped again in the forest. The following day we had some bigger, steeper climbs to make, and here Dea encountered more problems with her knee. It started to give her a lot of pain again, and I could see the anguish in her, the fear behind what it could mean. With a determination I could only admire she insisted to continue, and on the steep hills simply got off the bike and walked it up. This must have been very frustrating for her, but it was more frustrating for me, because she was still bloody faster than me. We stopped to take a break halfway up a particularly steep climb, sitting on the kerb at the roadside, when I noticed a woman looking at us from the window of a nearby house. She went from the window, and a few moments later she reappeared, walking down the road towards us. She brought with her a large slice of burek, a cheese pastry that Dea knew and loved from her time in Istanbul, and a bottle of water for us. It was a really nice and special act of kindness. We spoke with her a little. Her name was Andrea, and she told us she had lived here, in this house, her whole life. As a child she had walked up and down the steep hill that we’d just struggled up, to go to school, every single day. It brought things back into perspective for us. It was the first of several nice encounters we would have with Croatians. The next morning, tempted to stop and buy more burek from a town bakery, a man named Goran came over and greeted us. He was so pleased to meet us that he had goosebumps. Then later we were called over to join a family for coffee outside of their house. Actually it was two families, and nobody could speak any English, but as we found ways to communicate by sign language, and by showing maps and globes, I was being reminded of my previous travels in poorer lands. Croatia was a fairly developed country, yet it was not really like Western Europe, and sitting there with these two families on their porch I felt our transition to a different way of life was now underway. A beautiful, quiet road took us to Slunj, where we stayed for two nights with a warmshowers host named Frane. He was an extremely welcoming man, who talked to us for hours as he prepared us a delicious dinner. He had suffered some hardships in his life, but maintained an inspiringly positive attitude, and told us that he was preparing to leave Croatia and soon make a multi-year bicycle journey around the world. He seemed to have well-planned ideas, and thought he would need hosts for 300 nights given the length of his trip. He had therefore decided some time ago to first host at least 300 guests in his apartment. He’d been at it for a while, and Dea and I brought the total number of guests he’d had up to an impressive 320. Listening to Frane in his apartment also gave us a bit of an insight into the history of Croatia and the difficulties of the region. For example, he’d asked himself what he would do if a Serb asked to stay with him. It was a difficult decision, for of course the Serbs and the Croats were at war with one another not so very long ago. And in fact one Serb had asked him. Encouragingly, and commendably, Frane had decided he would host him (though he never arrived in the end). 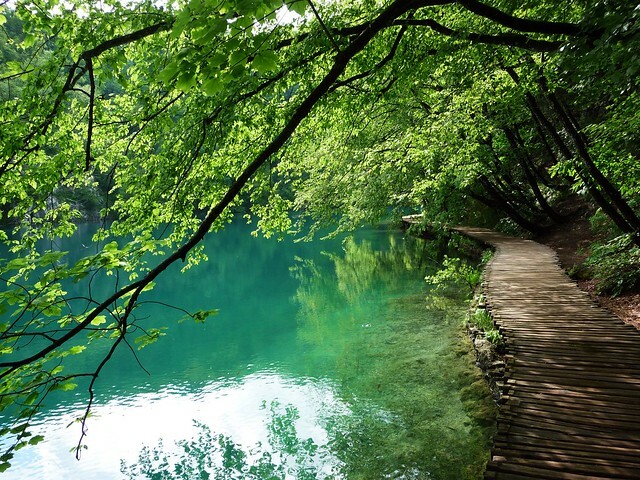 From Slunj we headed for Plitvice Lakes, Croatia’s star natural attraction. We set up camp just before the lakes so as to try and get there early and avoid the crowds. We knew visiting the lakes cost a budget-busting 14 euros each, but we weren’t sure where the main entrance was, and by chance found ourselves looking down at the lower lakes at a pull-out stop on a small road we’d taken. A series of steps led us down to the lakes without a ticket booth in sight, and narrow board-walks allowed us to walk out over the water. And it was a really very beautiful place to be, with the most incredibly lovely series of waterfalls flowing between the turquoise lakes. We enjoyed walking around the lower lakes for a while, at least until the tour groups started to arrive. Then the board-walks suddenly became rather a dangerous place to be, with large groups of Chinese wandering around staring into their cameras and stopping suddenly to take photos. We wondered how often it was that people got knocked into the water, and decided that it must be quite often, and we’d soon had enough of the crowds and decided we’d better leave. A little further along on our small road we came to a barrier, and a park warden told us we could not continue, and we’d have to backtrack quite a way and take the main road on the other side of the valley instead. This we did, and when we got over to the main road we saw the turn off for the main park entrance. We considered going and buying a ticket. We’d managed to see the lower falls for free, but there was still the upper falls. Then we decided the upper falls probably looked just like the lower falls, and there would by now be so many Chinese tourists that getting knocked in was practically guaranteed, and we didn’t have 28 euros, because we’d spent all our savings on Venetian ferry boats. So we just pedalled on to Bosnia instead.